We’ve bemoaned the milkweed shortage for weeks now, blaming the harsh winter and subsequent drought for a paltry wildflower season that resulted in a lack of Monarch butterfly host plants–just as the rebounding migrants are making their journey north through Texas. 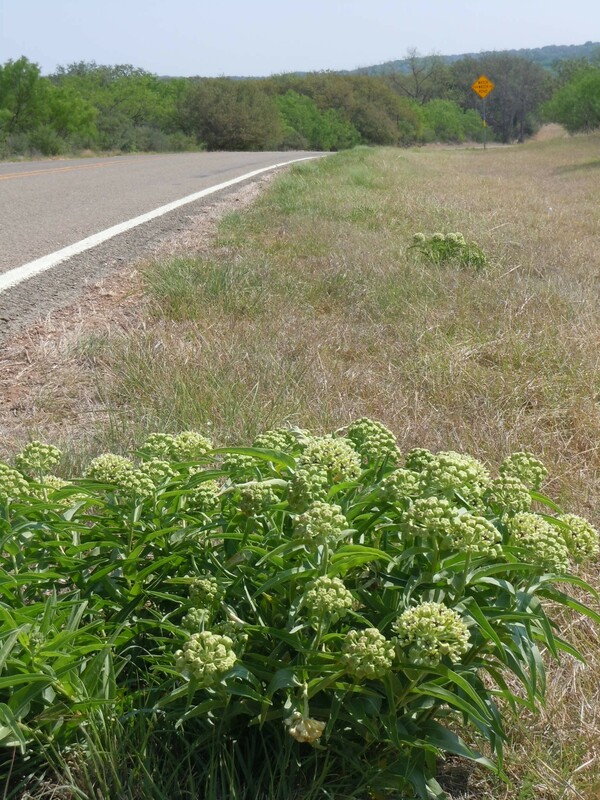 A drive west out Highway 71 on Sunday confirmed that little was blooming, with one exception: Asclepias asperula, also known as Antelope Horns. The plant is one of several Texas native Monarch butterfly hosts. Driving west through Johnson City and on to Fredericksburg and Mason, Antelope Horns dotted the roadside, poking its strange bulbous flowerheads and sturdy leaves from dry road shoulders, often the only nectar source in site. It was too windy for butterflies and we found no eggs or caterpillars on these resilient forbs. The exotic greenish-white bloomer also appeared in abundance near the parking area at the Ladybird Johnson Wildflower Center native plant sale in Austin on Saturday. Inside, milkweed shoppers were left wanting. “We don’t have any this year,” one volunteer offered, directing me to milkweed seeds on display at a tent hosted by Native American Seed of Junction. On the Llano River, stands of Asclepias incarnata, Swamp Milkweed, were making their debut, leaves and chutes jutting from dry native grass masses. None of the luscious pink flowers were visible yet, but we spotted many caterpillars and eggs, retrieving some for safekeeping and life cycle completion. The video above gives you a tour–and provides useful tips for those of you who have been emailing with questions on how to spot eggs and caterpillars on milkweed. And just so you know, you don’t have to leave home to find milkweed and Monarchs. 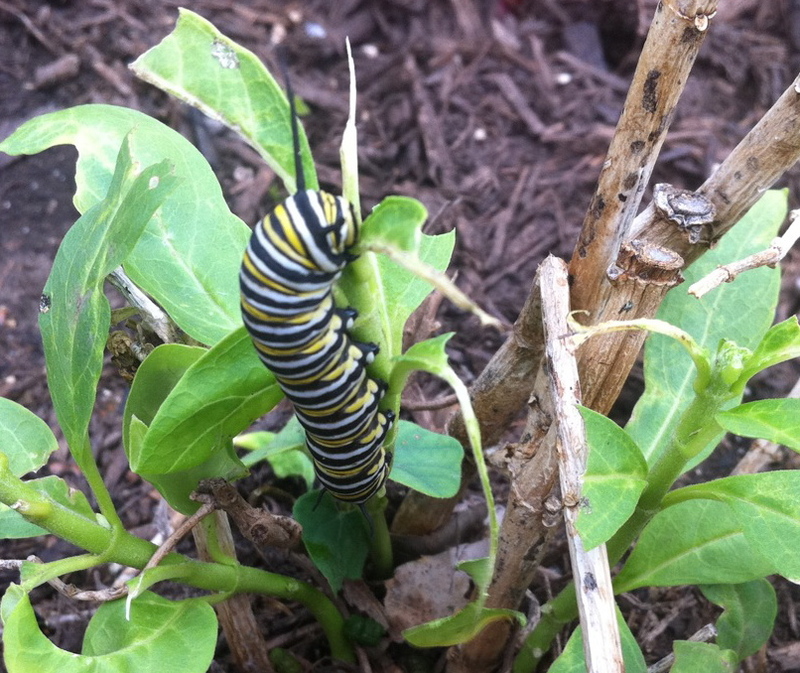 Upon my return late Sunday afternoon, a chubby Monarch caterpillar welcomed me in my Travis Heights front yard. As I unloaded the truck, she decimated the remnants of a Tropical milkweed, Asclepias curassavica, transplanted from San Antonio to Austin last fall. Plant milkweed and the Monarchs will come. Note: For info on which milkweed species are appropriate for our area, check out the Texas Butterfly Ranch Milkweed guide. In addition to a post about why you take caterpillars from the wild, a post about how you raise them to the pupa stage would be interesting. I occasionally need to help out pipevine swallowtail caterpillars and I raise them in a little plastic bug box. I have seen several monarch eggs on my milkweed this year, but they disappear after a day or two and I have yet to see a caterpillar. Ants are crawling up and down the stems, so they may be eating the eggs. The milkweed bugs showed up this week too. I am squashing them when I see them. I am sure the aphids will be along soon. That’s a great idea for a post and I’ve been meaning to get to that. Yes, it’s true that when you leave the eggs to nature they most often get slurped up by a predator. Just imagine what a delicious and easy meal a helpless butterfly-to-be is. A pure protein shot. A good resource for rearing strategies is http://monarchwatch.org/rear/cages.htm. I use a combination of jars, plastic salad boxes (the ones those fancy spring greens come in), tupperware with netting on top (secured by a rubber band), and netted cages. Also have tried tomato cages covered with netting. The Swallowtails are infamous for wandering far from the plant when they’re read to make their chrysalis, so they must be contained if you want to keep track of them. They’re beautiful butterflies. Good luck, stay tuned, and stay in touch! Yes, Emily, I’m aware of them, but thanks for making the connection. Thanks Dr. Danny. You’ll have to come back out and try your egg and caterpillar hunting skills. Looks like fun Monika. I’m happy to see your video (and your “helper”). It is definitely helpful for the caterpillars to be raised to the pupa stage and released. Each extra adult means more butterflies! That’s a great question. I wouldn’t take butterflies to the big city, but the fact is, eggs and caterpillars have only a 10% success rate of making it to the butterfly stage when left to the brutality of nature. By giving them a hand, their chance increase to 90%. It’s a dangerous world for butterflies-to-be. Between the spiders, wasps, birds, wind, ants, ladybugs (they love Monarch eggs), their chances are very diminished of completing the cycle. But you’re right, that’s a great idea for a blog post. Stay tuned and thanks for writing!